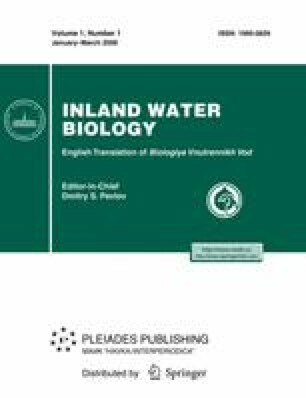 An annotated list of chironomid species from some waterbodies and watercourses of Mongolia identified by an imaginal developmental stage is presented. The list includes 97 species of 39 genera and 5 subfamilies: Tanypodinae (6 species), Diamesinae (1), Prodiamesinae (2), Orthocladiinae (33), and Chironominae (55). Of all found chironomid imagos, 11 species have been earlier identified for the Mongolian fauna, the other 86 species have been registered for the first time. The largest number of species has been recorded in Lake Sangiyn-Dalai—28; in Lake Ugiy and River Ider—19 species. In the rest of the lakes, the number of recorded species varies from 18 to 10 species, and in rivers, from 13 to 2. Most of the species are boreal and widespread. The number of Paleoarctic species amounts to 44 and Holarctic species amounts to 49. Original Russian Text © G.Kh. Shcherbina, N.I. Zelentsov, 2008, published in Biologiya Vnutrennikh Vod, No. 1, 2008, pp. 21–26.